There comes a time when even those who think they are mighty must fall. I crumpled at the craft, well I don’t know what to call it. “Room” gives it a gravitas it does not deserve and “Pile” fails to bring across the enormit of the job. In 1999 I began scrapbooking. I had always kept our photograph albums up to date and scrapbooking combined this with my love of playing with paper, pens and ink. All went swimmingly, I created pages that were lovely to look at, that had lots of journalling so we knew who everyone was and what they were doing and everybody loved to flick through them. Then two things happened. 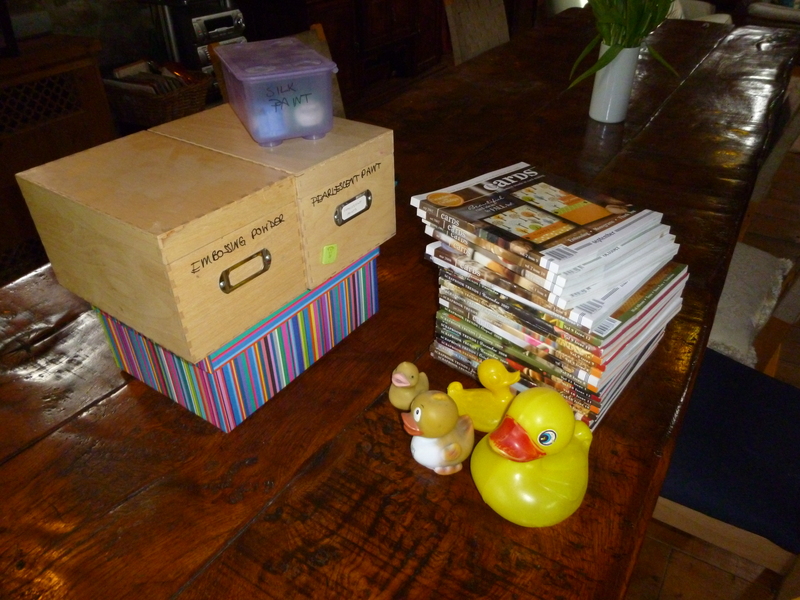 Photography went digital and scrapbooking went mainstream in the UK. Net result, too many photographs and too many materials to work with. Once I had to buy 80% of my stock online from the States, now I could get it in TK Maxx and Tescos. Sadly, the latter resulted in the death of practically every bricks and mortar scrapping shop and we have come full circle. If I want anything other than twee tat, I mainly have to buy from the US. Once again, I digress. I couldn’t be bothered to collate my photographs any longer. There were too many of them and I had too many materials. I didn’t know where to start. So I am going back to my roots…. I am not a tidy declutterer. 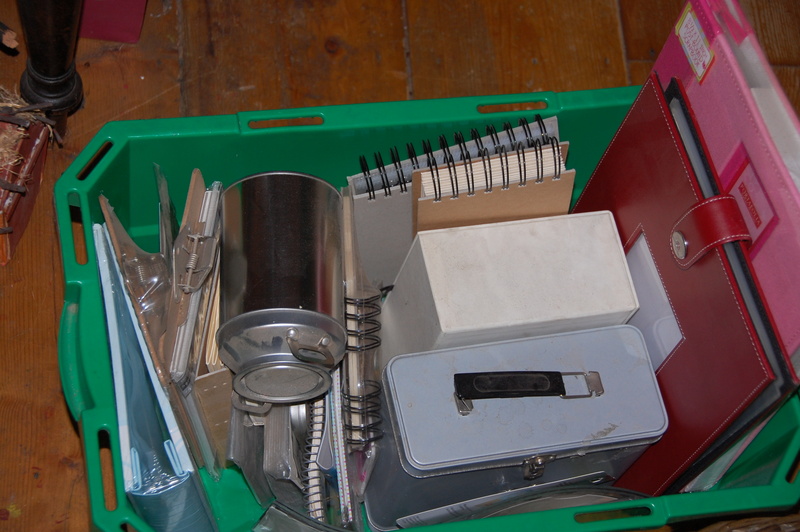 I like to get stuff out and sort it into piles or the bin. Only when I am finished do I put it all in order. Odd, perhaps as I am so organised elsewhere. 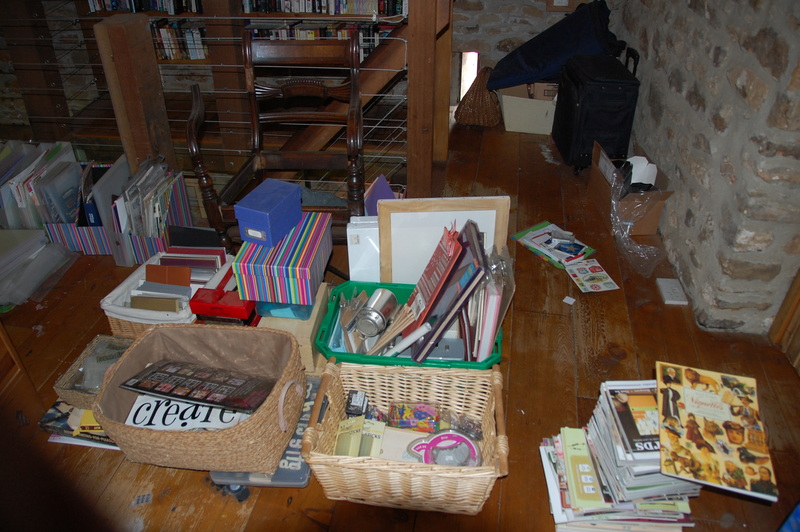 I think it’s because to me the declutter process has priority over the tidy process. I just want to get it out asap. 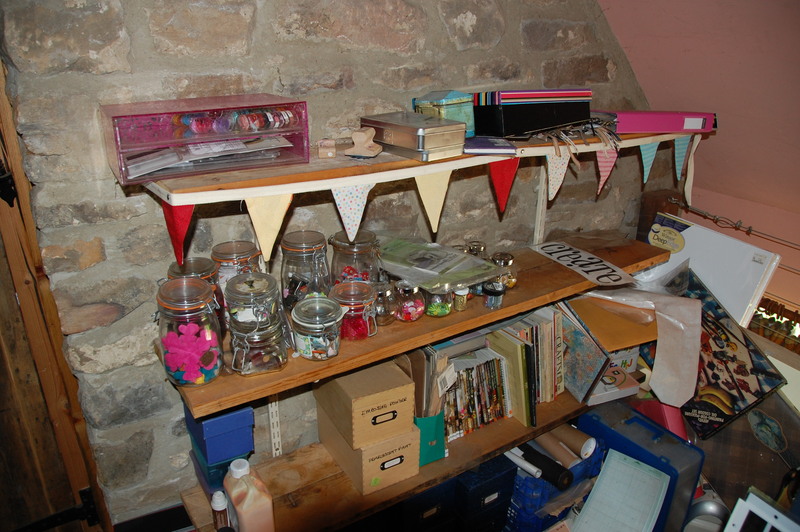 The desk is the “holding” area, most stuff on here will be allowed to stay. But not necesssarily here. 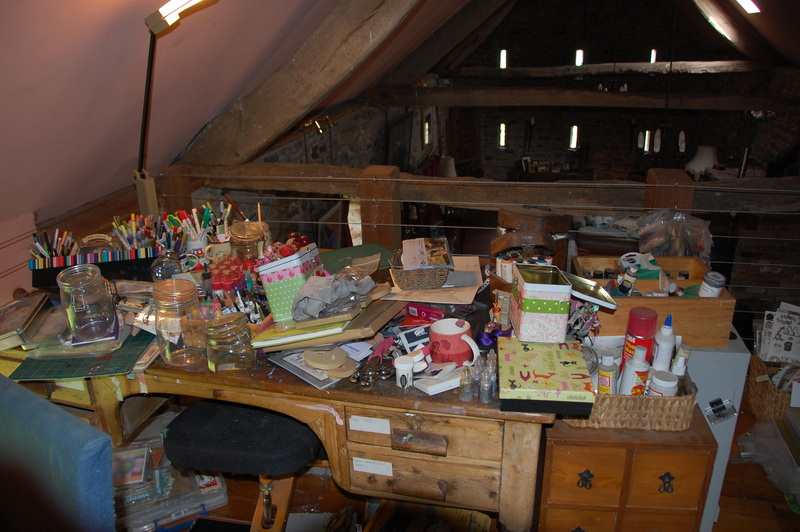 In the meantime I have emptied both the filing cabinet and the wooden chest of drawers but not done anything about the stuff that usually lives on the desk (paints and pens mainly). Not ideal, but I’ll get there in the end. Stuff to go. 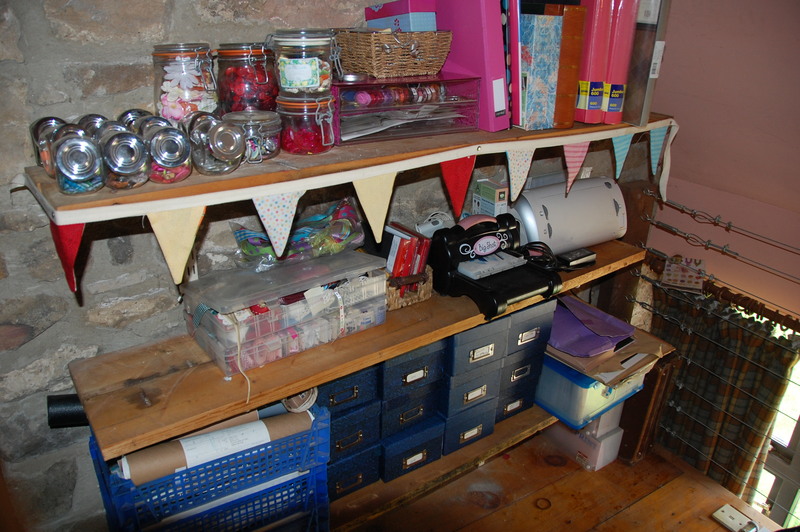 First dibs go to Sunday School and Messy Church, then local crafting friends and then the good old Charity shop. And finally, because all that was rather stressfull. 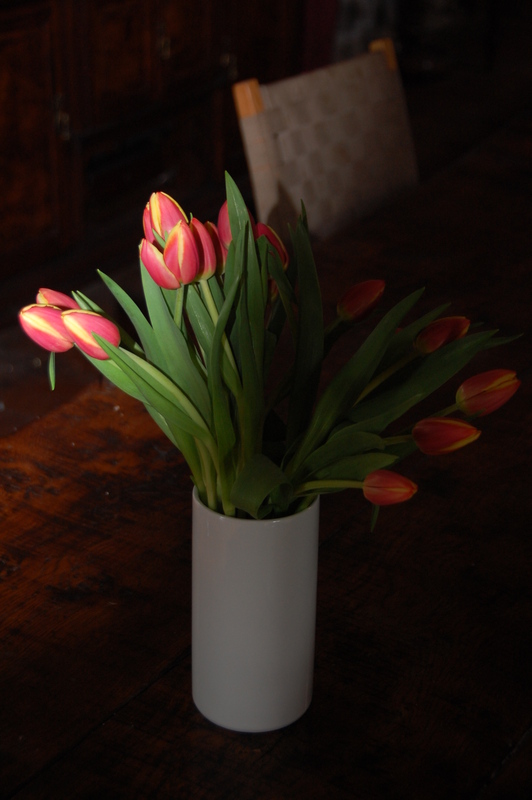 Some calming tulips. We all have them, those UFOs (unfinished objects) that we like to refer to as WIP (work in progress). Except that they are not, in progress that is. They are sitting in a box (what did I say about storage boxes) or a “craft bag” (aka black hole of UFOs). And they are not making any progress at all. Be honest. Even though you were really into cross stitch when your eldest was born 25 years ago and made beautiful samplers for every wedding and birth amongst your nearest and dearest, when did you last pick up a piece of aida? Give it away. Now. It is not going to make itself and you are not going to make it either. I have been culling the UFOs. I love looking at patchwork and I am immensley impressed by the work that people do but I have to be honest, it’s not really my thing. I have kept some stunning quilting squares which I used to make bags and totes (so now you all know what I’m giving everyone for Christmas). But the half finished quilt, which I don’t even particularly like so can’t imagine using even if I did finish it is out. As are two unused tapestry kits. On the other hand I do like to knit, I just am better at starting than finishing. Well until yesterday! I finally sewed up my granny squares and even the Dancers thought it was beautiful (which really is praise indeed). This is not a skirt, although I have been wondering whether to try it on. No, when complete it will be felted to within an inch of its life and then will be lined and will be a rather gorgeous tote. I have one already. This is earmarked for a friend. The rest of the knitting UFOs will be frogged. So what UFOs do you have lurking in your cupboards and what are you going to do with them? Time for a break. It’s the weekend, it’s cold and wet (well here anyway). I’m feeling not so much, “let’s get up and go” as “let’s stay by the fire and so something crafty, or read a book or just sleep, nodding off to the gentle rhythm of the snore of the newfie”. Since the snore of the newfie would wake the undead let alone the dead, I went for one of the other options. I have a bit of a thing for cashmere. Once you have been enveloped in the delicious waftyness and snugglyness that is pure cashmere, pure 100% new wool is like wearing barbed wire. Unfortunately I do not have the wallet that can run to cashmere on a daily basis so I stalk sales, and ebay, jumble sales and markets, charity shops and my mother’s wardrobe…. Once in my possession said cashmere is loved and cherished right up until the day it finally dies. Whereupon I bung it in a boil wash with some jeans and felt it. I have made felted cashmere cushion covers, cuddly toys, wrist warmers, ear warmers, slippers, bags, Christmas decorations. But until today I had never made a bed. Well a cat bed. Take one elderly, moth eaten cashmere cardigan. Boil it. Add one tapestry needle and some knitting wool. Lie the cardigan flat out on a table button side down (obviously if you are using a jumper you can lie it any way up you like). 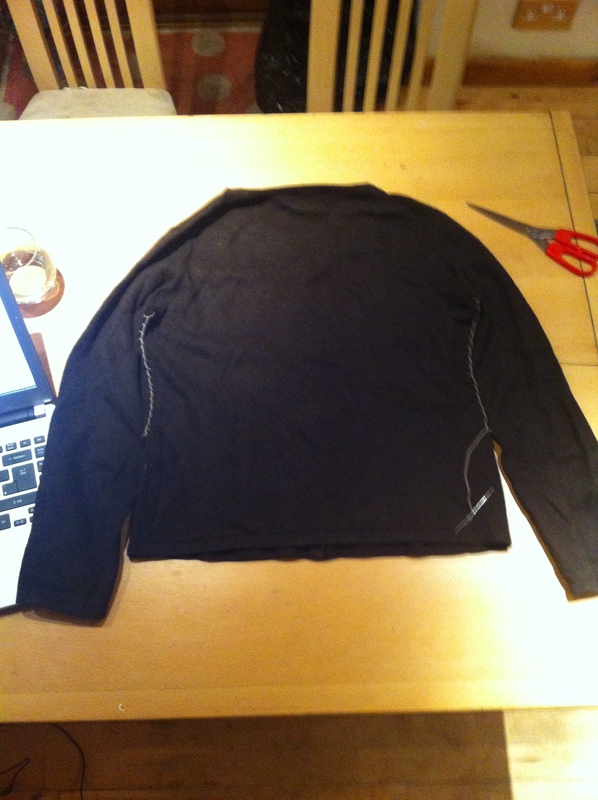 Sew the sleeve edge to the body edge to about half way down the sleeve. I used blanket stitch. 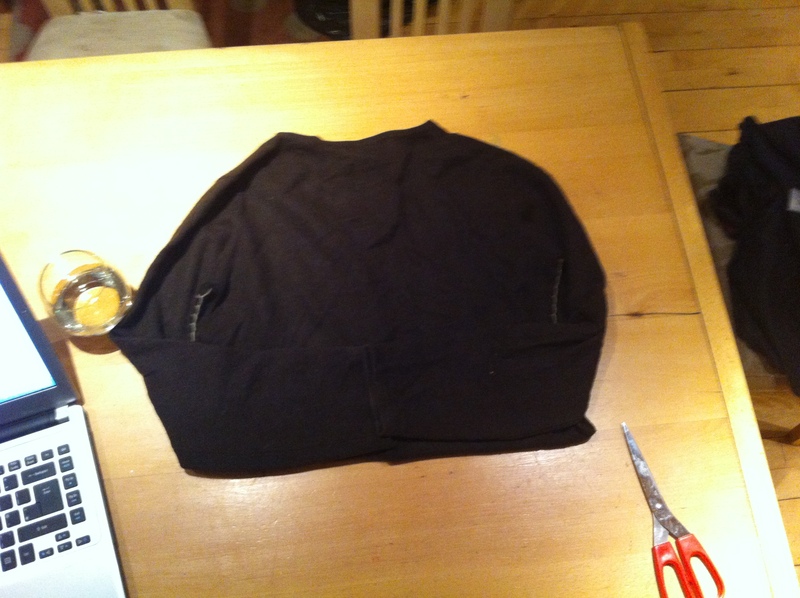 Fold up the bottom of the cardigan and lay the loose ends of the cardigan arms over the folded portion. Make sure the cuff edges overlap. 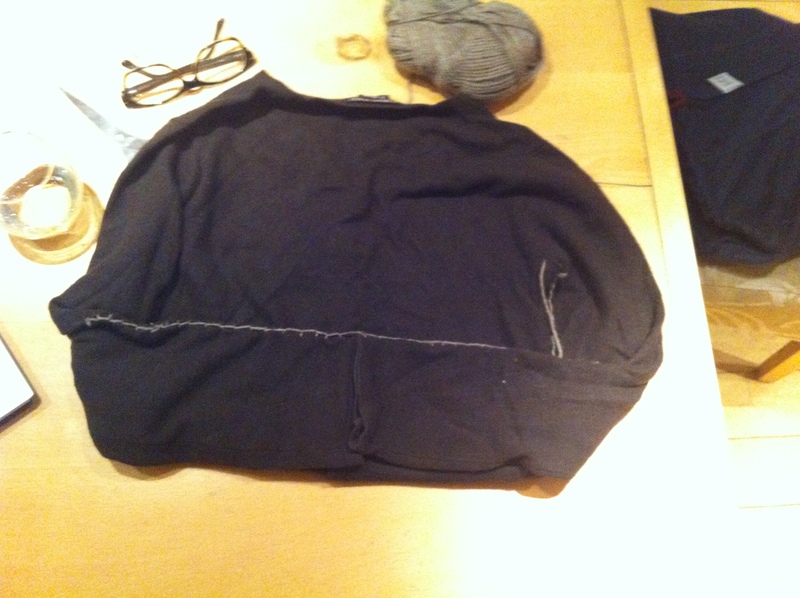 Sew the top edge of the sleeve to the top edge of the folded up cardigan edge (again I used blanket stitch). 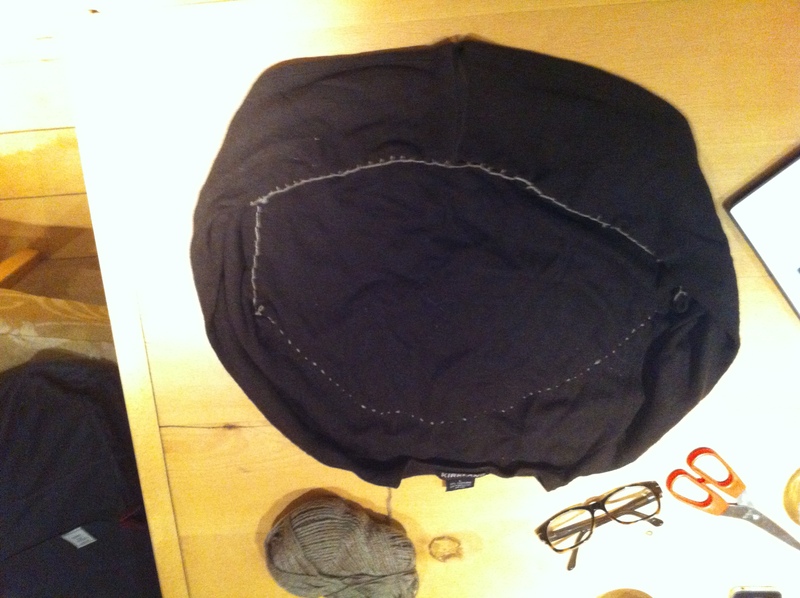 Lay the cardigan out flat again and sew (I used running stitch but you could use backstitch if you wanted it to be firmer) an arc from armpit to armpit. You have now created a channel all around the edge of your bed. Stuff the channel. 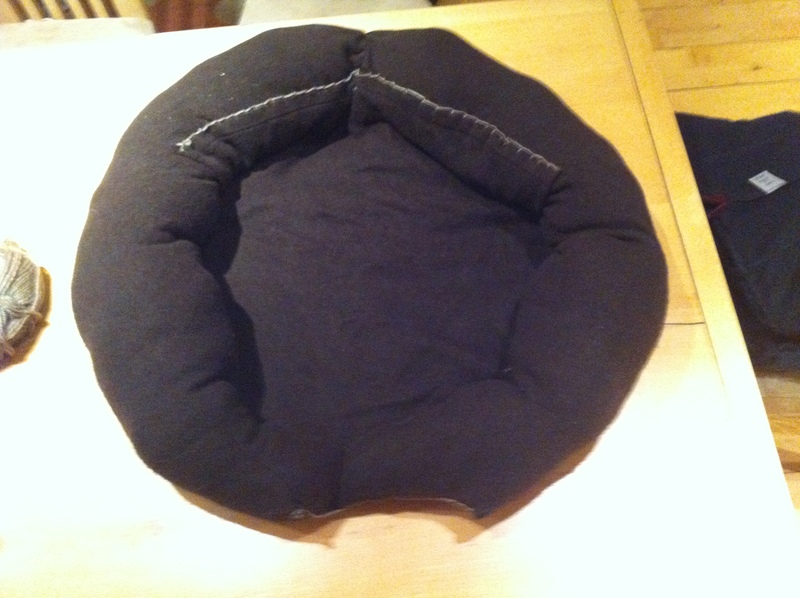 I used the contents of a number of horrible cushions, but you could use cut up rags, old clothes and dusters. You will have to wriggle the stuffing around a bit to get the right balance. Ta da! One cat bed.